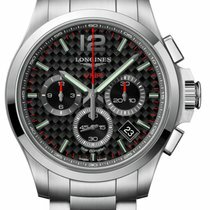 New/unworn Longines Conquest Automatic Chronograph L38004966. 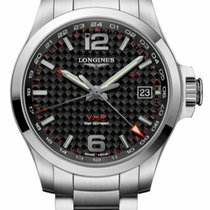 44mm Stainless steel case. Blue ”Sun-ray” dial with silver-tone hands and index-Arabic numeral hour markers. Minute markers around the outer rim. Luminescent hands and markers. Date display between the 4 and 5 o'clock position. Three Chronograph sub-dials displaying - 60 second, 30 minute and 12 hours. 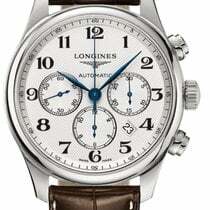 Longines Calibre L688 Automatic movement with 54 hour power reserve. Fixed stainless steel bracelet. Functions: chronograph, date, hour, minute & second . Anti-reflective scratch resistant sapphire crystal. Screw down crown. Solid case back. Case size: 44 mm. Stainless steel bracelet with a deployment clasp. Water resistant at 300 meters / 1000 feet.